Whether you're a restaurant, a cafeteria, a grocery store, or any other food service provider, there’s one product you can’t go into business without ? top quality food containers. Your food boxes and to-go containers are going home with your customers and will serve as a lasting impression of your establishment. Our sustainable food packaging solutions enhance customers' take-out experience by offering food containers that will protect their leftovers, as well as their refrigerator. They are leak resistant, stackable, and feature a unique locking system to keep its' contents fresh and delicious. 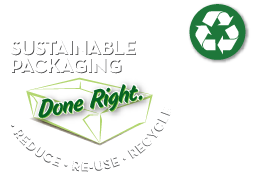 We are also proud to say that our products are made in the U.S.A. and are recyclable. This is important to your customers, and it's important to us.